Create a header that is right for the project. A good default is book title on all left-side pages after the front matter has ended. The starting page of a new chapter should have no header. The remaining right-side pages should display the chapter title. When you set each chapter to start on the next odd page (right-side), this may cause a blank page to occur on the preceding even-numbered page. Be creative! This is a great space to include a Scripture, a call-out quote, or a graphic element. There are four main margins to take into consideration when creating a book layout: top, bottom, outside, and inside (also called the gutter). I default to 7 pixels for the top, 5 pixels for the bottom, and 5 pixels for the outside and inside margins. Keep in mind that this is only a default and will not work for every project. Bleed is the outside area of the book that will be trimmed away at time of print. If you incorporate graphics that go all the way out to the edge, then you will have to account for bleed by increasing your document size by .125” on all sides. Check with your printer for their specific regulations. Footers are also customizeable, but you can’t go wrong with the centered page number. If the project allows, place the page number inside a decorative element. 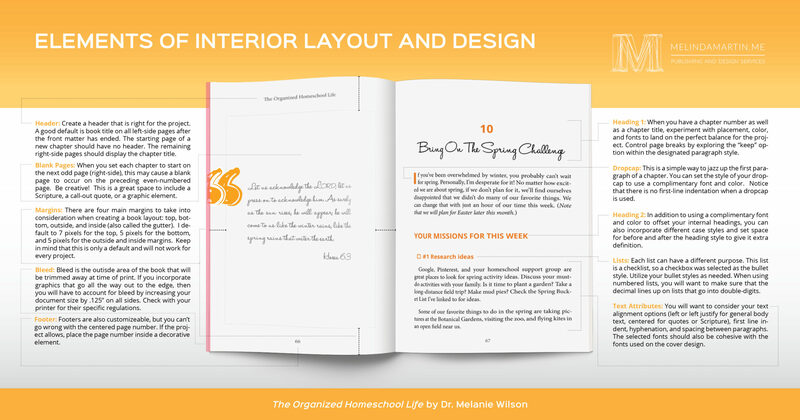 When you have a chapter number as well as a chapter title, experiment with placement, color, and fonts to land on the perfect balance for the project. Control page breaks by exploring the “keep” option within the designated paragraph style. This is a simple way to jazz up the first paragraph of a chapter. You can set the style of your dropcap to use a complimentary font and color. Notice that there is no first-line indentation when a dropcap is used. In addition to using a complimentary font and color to offset your internal headings, you can also incorporate different case styles and set space for before and after the heading style to give it extra definition. Each list can have a different purpose. This list is a checklist, so a checkbox was selected as the bullet style. Utilize your bullet styles as needed. When using numbered lists, you will want to make sure that the decimal lines up on lists that go into double-digits. You will want to consider your text alignment options (left or left justify for general body text, centered for quotes or Scripture), first line indent, hyphenation, and spacing between paragraphs. The selected fonts should also be cohesive with the fonts used on the cover design.